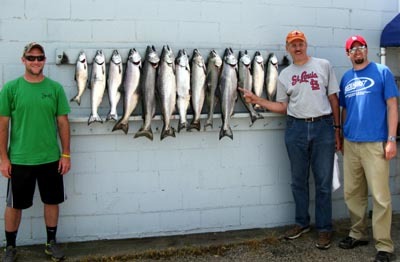 After our good day fishing on Wednesday we went right back to the same area and put out the same spread that worked for us then. We did not get the same results. The water had warmed a few degrees, but conditions looked the same. We had a tough day with seven bites and four fish. Not really hearing of anything better we went back to the 01’s on Friday and tried it again. We set up in 140 feet of water (fow) in the 01’s and took it north. We marked loads of bait and some fish as well. Our first bite was on a 300 copper with a 10″ White Slick Spin Doctor/UV Green Big Water meat Rig. It was a nice king. A low wire diver out 130 with a 10″ White Crush Spin Doctor/Froggie Big Water rig took the next King. A heavy fog set in and that made it tough to stay in the 140 to 150 foot range because several boats were working in that area. 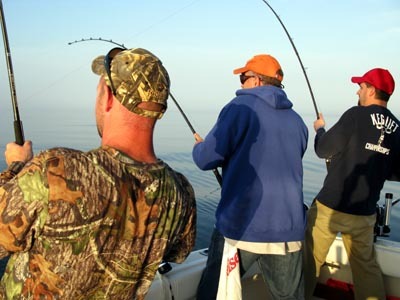 We decided to work on the outside of the pack fishing between 180 and 250 fow the rest of the morning . We were getting lots of hits, but they weren’t hooking up well. One of our out downs took a hit at 85 feet down on a glow spoon. It was about a 6 lb. Coho. That explained why we weren’t getting the good hook ups. They were Coho bites. 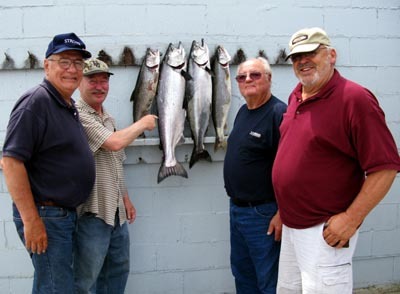 We ended up taking 3 more of them, a couple more Kings and a Lake Trout. We don’t have another scheduled until next Tuesday. 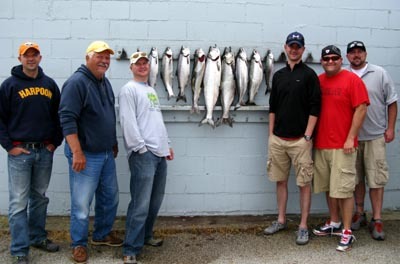 Good fishing today north of Ludington harbor. We set up in 120 feet of water (fow) in the middle of the 01’s. The surface temp was 58 degrees and it was 57 down 70 feet. The temps were a little warmer than we had hoped so we moved out to deeper water. Our first bites came in 170 fow. The first couple hours of the trip we hit quite a few fish then the action slowed . We worked out as far as 250 feet and back in to 150 feet and trolled as far north as the 05’s. We took fish on 350, 400 & 450 coppers, all of our wire divers took fish and we had hits on all three riggers. Our chute rigger down 145 with an 11″ White Paddle/Pickled Sunshine Action fly went twice. One out down set at 95 ft. took a fish on a Magnum Dreamweaver Beefeater. The other out down set at 115 ft. had a 10″ Glow Blade Dark Green Tape/Green Mile Big Water Meat Rig stacked with a regular size glow spoon and it took 2 bites, one of the meat and one on the stack. We had 10′ Spin Doctors and Big Water Meat Rigs on all our coppers. Our high wires were out 320 and 330 and 220 and 230 on the lows. Our most productive diver was a high with a 10′ Kevorkian Spin Doctor/UV On Ice Big Water Rig out 330 feet.